Bloomfield residents on Wednesday saw the final result of months-long neighborhood brainstorming effort about the future of the ShurSave IGA site. Adapting mockups built by residents, the Lawrenceville-based Studio for Spatial Practice [SFSP] built three models of the neighborhood’s “gateway” property focused on distinct types of development: retail, housing and office space. 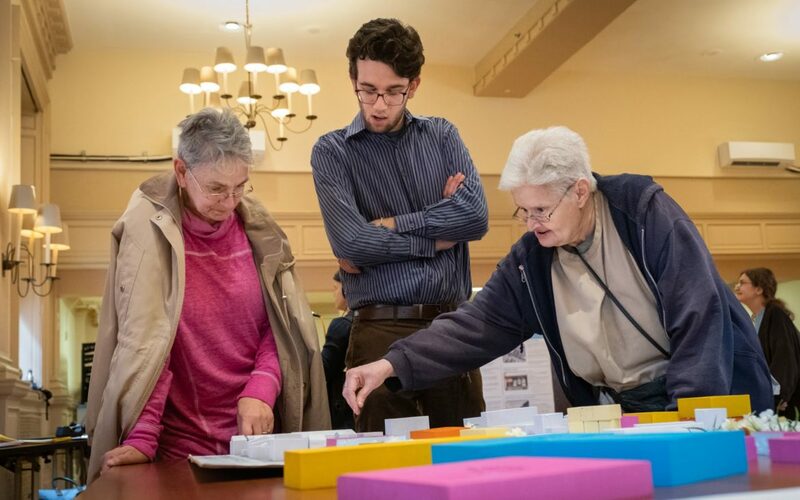 About 30 residents viewed the final models at an open house at West Penn Hospital held by ACTION-Housing, the Bloomfield Development Corporation and SFSP. 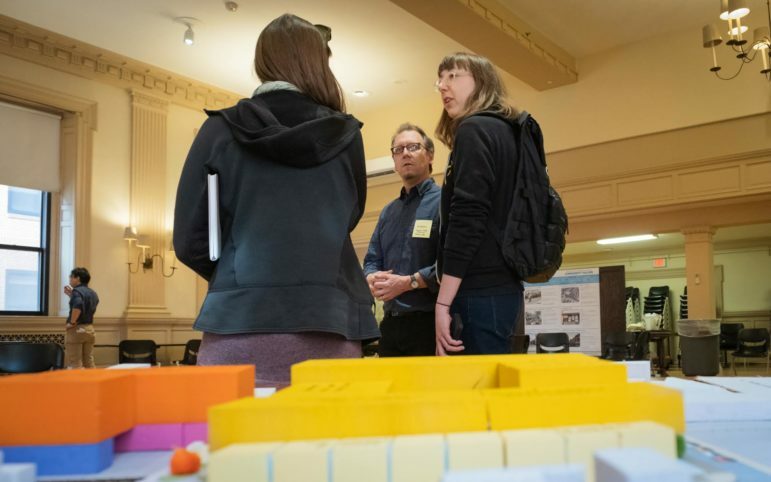 At a February workshop, residents built models of the site out of foam blocks to convey their recommendations to a future developer of the property, which is currently for sale. Previously, residents identified favorite memories of the area and values like diversity and affordability they want to preserve. SFSP principal Jonathan Kline said the residents’ ideas were adapted to consider height restrictions, public use and number of buildings. Kline said the final models were meant to blend the residents’ suggestions with the aesthetic and residential nature of the neighborhood. Instead of delivering only one resident-led proposal, leaders of the brainstorming process decided to include three options to offer flexibility in negotiating with a future developer. All had two medium-sized buildings instead of one large building. This would allow for pedestrian foot traffic through the site and also limits the size of future structures. The models included a public plaza or open space for residents to use, and the buildings were three to four stories, intending to match the size of existing buildings in Bloomfield. Resident Gary Ratkovich, 43, said he was impressed by how accurately the process seemed to reflect the views of residents. But Ratkovich acknowledged the main limitation of the process. It represents the views of residents, but residents don’t have control over what actually happens at the site. What happens at the gateway is an open question. For more than 35 years, Bloomfield residents have bought groceries at the ShurSave site, and many vocally opposed a past proposal from Milhaus Development, an Indianapolis-based company that backed away from its development plans last year. Residents now want to proactively have a say if the site is sold to be redeveloped. The future of the site is about more than aesthetics. Trisanne DelGrosso, 63, worries new development could lead to rising rent. “I think they’re just going to put all high-rises and the high-quality apartments, and we’re not going to be able to afford it,” said DelGrosso, who has lived in Bloomfield for 18 years. DelGrosso attended the open house with Margaret Hochdoerfer, her longtime friend and neighbor. Hochdoerfer, 70, was born and raised in Bloomfield. She said she wasn’t concerned about the impact on the surrounding neighborhood, but she does think the area needs more retail spaces. “We do need a clothing store and a shoe store, we do,” Hochdoerfer said. For the open house, SFSP summarized the entire process so far with large, colorful posters around the room. Tables around the auditorium reflected the stages in the process. Pictures from community meetings in January and February were featured in a slideshow projected on a screen at the front of the room. The 10 designs built by Bloomfield residents at the February meeting were lined up on one side of the auditorium, as well as a station where residents could build their ideal future Bloomfield. In DelGrosso’s view, a future developer should make resident input a priority. Hannah Schneider is an editorial intern for PublicSource. She can be reached at hannah@publicsource.org. Develop PGH has been made possible with funding from The Heinz Endowments.